Community outreach and service is a major part of the Penn State Berks experience for students, faculty, and staff. From programs for middle and high school students to seminars and workshops for business executives to hosting community events, the college is dedicated to serving its community. 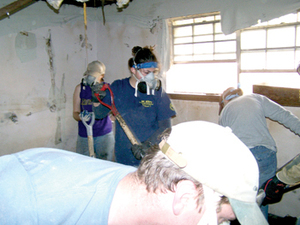 Rather than heading to the beach for spring break, a group of 28 students from Berks took a trip to New Orleans to assist in the labor-intensive process of cleaning up homes that had been destroyed by Hurricane Katrina. Berks students also volunteer their time to help build homes for financially disadvantaged families with Habitat for Humanity, tutor inner-city youth through the Penn State Educational Partnership, and raise money to support THON, Penn State?s 48-hour dance marathon to benefit pediatric cancer. In total, our students, faculty, and staff annually contribute more than $1.6 million worth of volunteer services to the Greater Reading area. Penn State Berks, working with the Berks Economic Partnership and the partnering other four institutions of higher education in the Greater Reading Area, recently received a $15,000 Keystone Innovation Zone (KIZ) planning grant from the Pennsylvania Department of Community and Economic Development?s Technology Investment Office. The planning grant will fund the development of a full KIZ proposal focusing on the strengths of Penn State Berks and the partnerships with the Higher Education Council of Berks County; as well as the technology, corporate, and health centers that exist along the Route 183 Corridor. It is anticipated that the full, three-year KIZ proposal for $235,000 will be submitted to the Technology Innovation Office by early fall 2006. In addition, Penn State Berks? Office of Continuing Education has recently invested $15,000 in funding to assist the Workforce Investment Board in starting a project focused on the development of educational programs targeted at building a pool of qualified information technology workers, which will help support the transformation of the economy of the Greater Reading area.